President Mark opened the meeting (after dragging a few of us out of the bar where the Giants were playing the Royals). He was only able to do this by streaming the game onto the big screen in the ballroom where our club meets. Mark noted that in scheduling the evening meeting, he could not have anticipated that our San Francisco Giants would be playing game 7 this very night. As a result, knowing the turnout would be low, he postponed the Murder Mystery that had been scheduled for another time. Since the game was what everyone was thinking about, the “official” portion of the meeting was likely the shortest on record, coming in at 6 minutes and 42 seconds! Eunice Valentine, aware of the theme for the evening (baseball), shared a few famous and very humorous Yogi Berra quotes. There were a few guests present including first Rotary lady Mel Konrad, Rick Allen’s wife Patricia. In addition, Julia Parranto’s wife Rose and daughters were also in attendance. Knick Knickerbocker noted that our club was still lagging in ticket sales for next Thursday’s Veterans Program at the Vet’s Building. Julia Parranto stepped up and purchased 20 tickets. A number of others also purchased 1 to 10 tickets, some to donate to veterans who might not otherwise be able to afford to attend. Thanks Rotarians!! DINNER, COMMARADARIE AND A BASEBALL GAME! As mentioned before, President Mark streamed the game through his computer onto the big screen. At one point, Mark’s computer had a meltdown and Pete Lescure saved the day by replacing it with his computer, which he quickly fetched from his car. Those in attendance enjoyed a fine prime rib dinner and conversation while at the same time cheering on YOUR SAN FRANCISCO GIANTS! 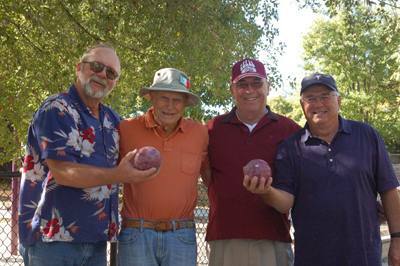 When the inter-club Bocce Tournament was canceled due to rain, eight stalwart Santa Rosa Rotarians decided to carry on with our own intra-club challenge. 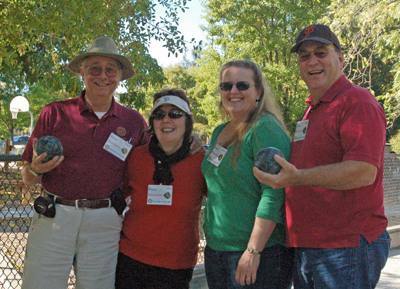 There were two teams: The Bocce Buccaneers (Karen Ball, Bart Eddy, MeL Konrad and “Capo” President Mark) stood against the Red Express (Troy Aldrich [1st game] Dennis Ball [2nd game], Bob Sorensen, John Poremda, and “Capo” Rich deLambert.) 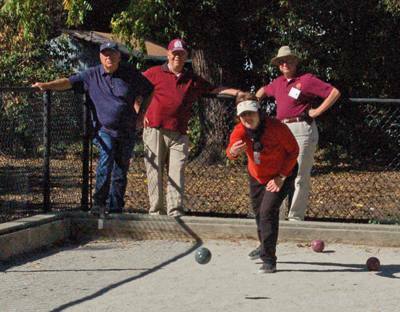 They all met on a sunny Sunday, on the Bocce Courts at DeMeo Park in the quiet West End Neighborhood, near Railroad Square. 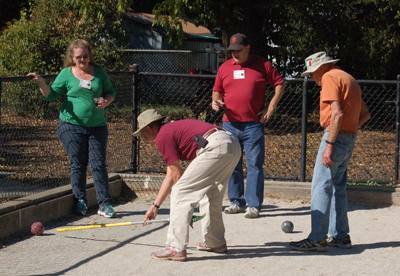 Pallinos and Bocce balls were rolled, wine was poured, snacks were consumed, and more Bocce balls were rolled. Did I mention that wine was poured? Perhaps that had something to do with the scoring, as the wine did not last for both games. 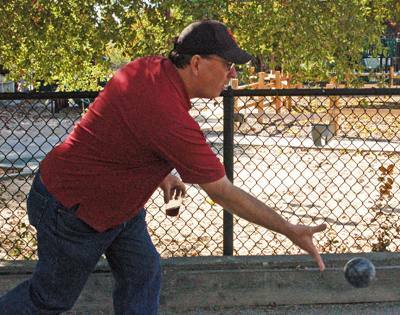 While the Bocce Buccaneers held on right to the end of the first game with a narrow 11-10 loss, the Red Express charged ahead in the second game, blowing out the Bocce Buccaneers 11-4. Nevertheless, a good time was had by all, and the Bocce Buccaneers will be making a contribution to the local Foundation’s John Brown fund to honor their side bet. 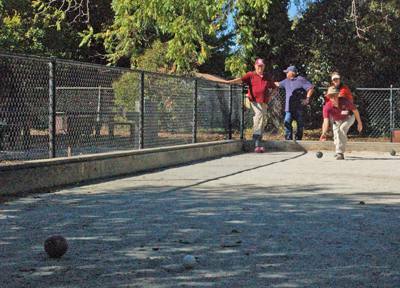 There was talk of trying to schedule a regular Bocce game for Santa Rosa Rotary Club members and friends. If you are interested, contact Rich deLambert or President Mark. Bart Eddy shows fine form. Never spilled a drop! Using a rake as a sophisticated measuring tool!